Royal is one of the leading manufacturer of high tech machinery parts for various industries. We manufacture parts for industries like textile, cement, steel plants, railways as well as hydraulic and pneumatic industries. We have now introduced a very special rice roller for paddy husking machines made of specialty polymers. Due to our proficiency of this field, we are engaged in presenting Rice Dehusking Rubber Rollers. We are presenting these products to customers within given time-frame. 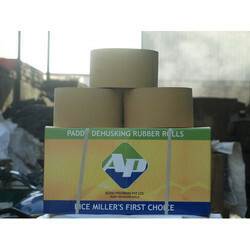 Owing to the wide experience in this domain, we are instrumental in offering Rice Polisher Rubber Roll to our clients. Godavari Petro Products Pvt. 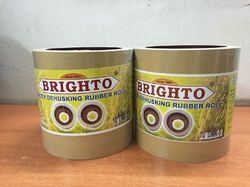 Ltd.
DMR-6 De Husking Rice Rubber Rolls, Rice Dehusking Rubber Rolls, Rice Dehusking Rolls are our specialty, which we produce on fresh CI Drums. We can also produce the sme on Aluminum Drums, on the customer’s demand. We are one of the leading manufacturer and supplier of Rice De-husking Rubber Rolls. They are made of premium quality raw materials and are manufactured in vast range as per requirement. The rolls we offer are checked with pre-defined quality parameters to maintain the supreme quality of the product.